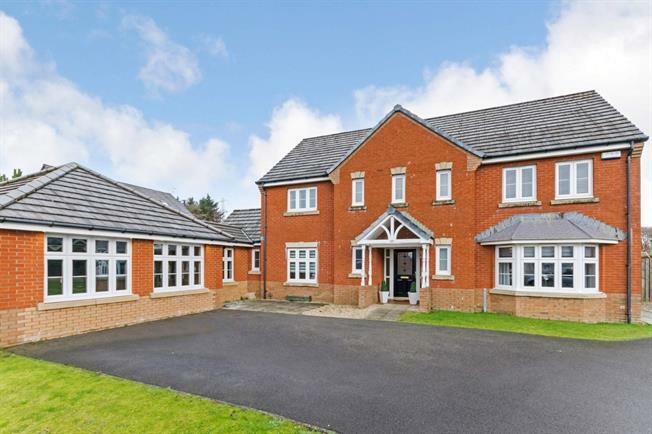 4 Bedroom Detached House For Sale in Glasgow for Offers Over £385,000. Set within an exclusive development on the outskirts of East Kilbride this detached villa has been successfully extended to offer an abundance of beautifully presented and highly flexible accommodation. The layout over two levels includes: broad reception hall, WC, dual aspect lounge, formal dining room, office/playroom, attractive kitchen, family room, utility room and bonus area linking the property to the converted garage now offering a fabulous games room. The upper landing leads to four generously sized bedrooms with extensive storage, master and guest with en-suite facilities and further bathroom. Featuring double glazing, gas central heating, security alarm system and contemporary decoration the property offers true walk in style conditions. The substantial garden grounds are mainly laid to lawn and incorporate an expansive driveway ensuring ample off street parking. Easy access is ensured to a wide variety of local facilities including quality schooling, town centre shopping, train station and various leisure pursuits including the adjacent golf course.